Malware Explorer — Fortinet for who? Tags: Filtering Technology, Internet Censorship. Fortinet employs a two-tier sales model, in which we sell 100 percent of our products to resellers, who then sell to end-users. We do not directly sell, deploy or configure our products for end-users. Additionally, we have no record in our databases of Myanmar Millennium Group being a Fortinet reseller. 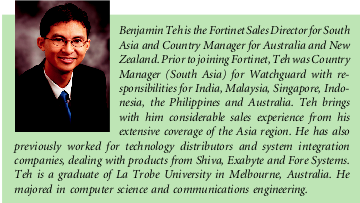 But DerekB discovered that Burma actually had a ceremony to commemorate the installation of Fortinet and that Ben Teh, Forntinet Sales Director for South Asia and Country Manager for Australia and New Zealand, had attended the ceremony, given a audio/visual presentation on Fortinet and presented a gift to the Burmese Prime Minister. Teh today denied that Fortinet has any involvement in Burma and refused to confirm or deny whether he visited Rangoon last year. “We don’t have any direct resellers and we don’t have any direct partners in Myanmar [Burma],” he said, refusing to comment further. Here is a picure from Burmese TV of Ben Teh presenting his gift to the Burmese Prime Minister. See, there is a the little problem of the Burmese Freedom and Democracy Act of 2003 which the New York Times suggests Fortinet may be in violation of. I am not a lawyer, but this Act only seems to affect imports from Burma, not exports. In fact the U.S. Department of Treasury states that exports to Burma are (there are exceptions for financial services and about who you can export to, but not exports themselves) are not prohibited. So unless Fortinet sold their filtering product to a prohibited person — which appears to be persons who hold senior positions in the State Peace and Development Council or the Union Solidarity Development Association. It’s all somewhat odd. Section three of the Burmese Freedom and Democracy Act is titled “BAN AGAINST TRADE THAT SUPPORTS THE MILITARY REGIME OF BURMA” but it does not seem to prevent U.S. companies from selling censorship and surveillance equipment to Burma, it only affects imports. The ironly of all this is that we are continually seeing U.S.-made filtering products being used by authoritarian regimes to implement Internet censorship worldwide. Posted by John Palfrey on October 13th, 2005. Posted by Info/Law » Tilting the Table, Channeling the Flow on July 6th, 2006. LOL…”oops”, I love it they even made a division of the repressive Burmese government a reseller! Fortinet is also the company that got busted for using GPL freeware as sourcecode, encrypting it and passing it off as their own code and let’s not forget the Trend Micro lawsuit….These guys are slimy. Posted by Joe on March 3rd, 2007. From what i’ve been able to find, somehow Burma got one Fortinet unit and then did a splash campaign making it look like that one box could service millions of computers. Where did you get that “busted for GPL” info… from wiki? Their article of Fortinet almost reads like Fortinet takes candy from babies! And does Trend Micro make more of its money from stupid patent lawsuits (like Mosaid) than from actually making products? Personally I’m in favor of companies that make things rather than make profits from suing others. I’ve used their products and they are really good. The level of control over how you protect your network is really good. If Fortinet is slimy, i’d love to see your description of some other big business companies in the states. Posted by Dave on May 18th, 2007. Posted by Citizens Lab – Behind Blue Coat: Investigations of commercial filtering in Syria and Burma » On Books, Movies and Other Stuff on January 27th, 2012. Posted by Repression 2.0 « linnet taylor on November 26th, 2012.